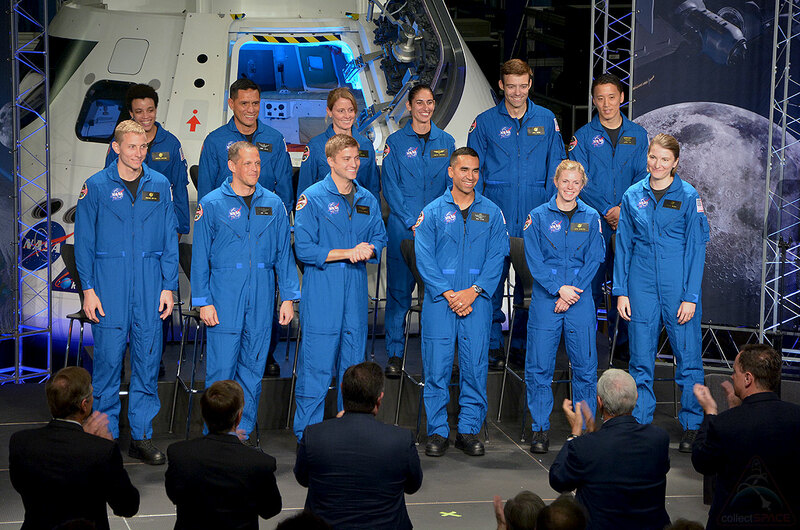 — NASA introduced 12 new astronauts on Wednesday (June 7), who will train for missions into Earth orbit and to deep space. 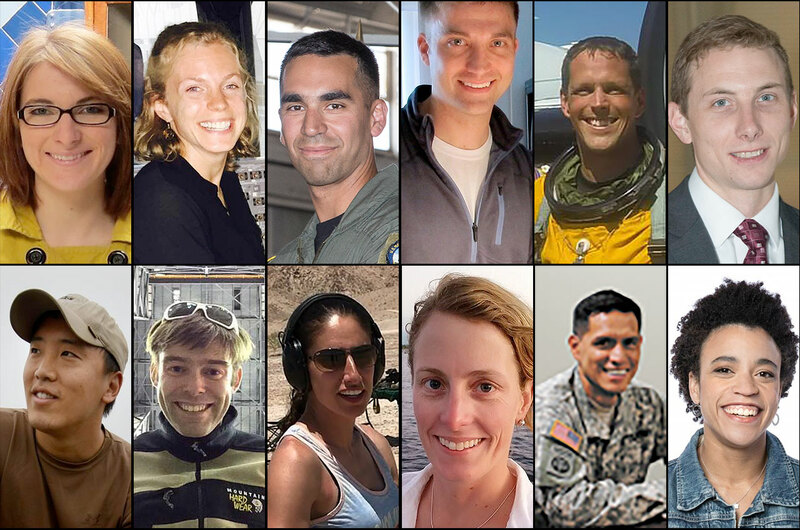 The seven men and five women comprise the 22nd class of American spaceflight trainees since 1959. The group is the largest NASA has selected in almost two decades. 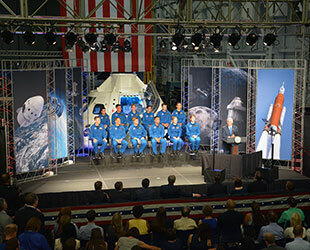 Vice President Mike Pence joined NASA leaders, including acting administrator Robert Lightfoot and director of flight operations Brian Kelly, in Houston, Texas to announce the new astronaut candidates, or "ascans." The event was set inside the Johnson Space Center's Space Vehicle Mockup Facility in front of a full-scale engineering model of NASA's Orion spacecraft, which the new astronauts might fly in the coming years on missions beyond low Earth orbit. 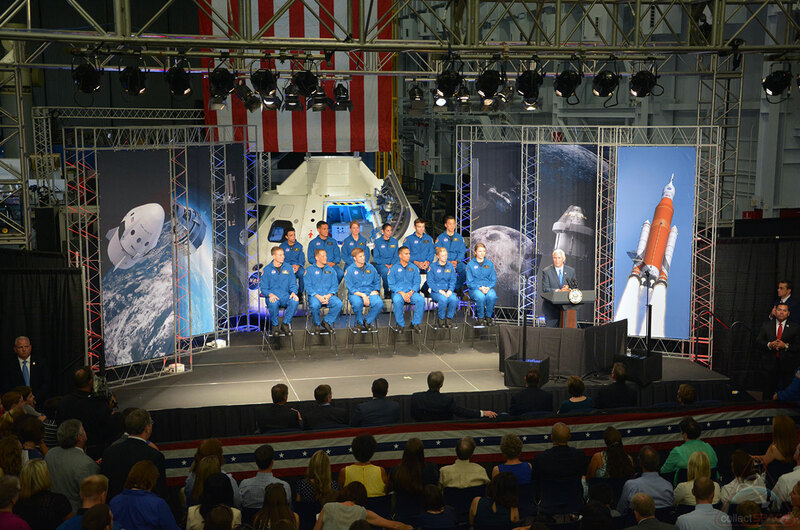 "To the members of this new class of American astronauts, I say congratulations," remarked Pence. "You have already captured the admiration and respect of your peers — when you lift off the launch pad, to boldly go, you will capture the imagination of your nation and the world." "As American astronauts, you may yet return our nation to the moon. You may be the first to travel to Mars. You may have experiences that we can only imagine," Pence said. The ascans, who will report in August to begin two years of basic training, may also launch aboard commercial crewed spacecraft being built by Boeing and SpaceX for flights to the International Space Station. Lt. Kayla Barron, a 29-year-old U.S. Navy submarine officer from Richland, Washington. A member of the U.S. Navy's first class of women commissioned into the submarine community, Barron comes to NASA from the Naval Academy in Annapolis, Maryland, where she has been serving as the Flag Aide to the Superintendent. Zena Cardman, a 29-year-old geobiologist who calls Williamsburg, Virginia, home. Cardman's research at Penn State University in Pennsylvania has focused on microorganisms in subsurface environments, ranging from caves to deep sea sediments. She has embarked on multiple Antarctic expeditions, worked on research vessels and joined NASA analog missions in British Columbia, Idaho and Hawaii. Lt. Col. Raja "Grinder" Chari, the 39-year-old commander of the 461st Flight Test Squadron and the director of the F-35 Integrated Test Force at Edwards Air Force Base in California. Hailing from Waterloo, Iowa, Chari earned a Master's degree in aeronautics and astronautics from MIT and graduated from the U.S. Naval Test Pilot School. Lt. Cmdr. Matthew Dominick, the 35-year-old department head for the U.S. Navy's Strike Fighter Squadron 115. Born and raised in Wheat Ridge, Colorado, Dominick was at sea on the USS Ronald Reagan when he got the call on May 25 saying he had been selected as an astronaut candidate. Bob Hines, a 42-year-old NASA research pilot based at Johnson Space Center since 2012. Hines considers Harrisburg, Pennsylvania, his hometown. He attended the U.S. Air Force Test Pilot School for his Master's degree in flight test engineering and then the University of Alabama, where he earned a Master's degree in aerospace engineering. He has served in the U.S. Air Force and Air Force Reserves for 18 years. Warren "Woody" Hoburg, a 31-year-old assistant professor of aeronautics and astronautics at MIT. Originally from Pittsburgh, Pennsylvania, he earned a doctorate in electrical engineering and computer science from the University of California, Berkley. He is a private pilot and has extensive experience with wilderness survival. Dr. Jonny Kim, a 33-year-old Navy lieutenant and SEAL, who has has been on active duty reserve while completing his residency at Massachusetts General Hospital. Born and raised in Los Angeles, Kim completed more than 100 combat operations and earned a Silver Star and Bronze Star with Valor. Afterward, he went on to complete a degree in Mathematics at the University of San Diego and a Doctorate of Medicine at Harvard Medical School. Robb Kulin, the 33-year-old lead of the Launch Chief Engineering group at SpaceX in Hawthorne, California. Hailing from Anchorage, Alaska, Kulin completed a Master's degree in materials science and a doctorate in engineering at the University of California, San Diego. He has previous experience as an ice driller in Antarctica on the West Antarctic Ice Sheet and Taylor Glaciers and as a commercial fisherman in Chignik, Alaska. Maj. Jasmin Moghbeli, the 33-year-old quality assurance and avionics officer for the Marine Corps' Operational Test and Evaluation Squadron 1 in Yuma, Arizona. Moghbeli considers Baldwin, New York, her hometown. She earned a Master's degree in aerospace engineering from the Naval Postgraduate School and is a distinguished graduate of the Navy's Test Pilot School. Loral O'Hara, a 34-year-old research engineer at Woods Hole Oceanographic Institution in Woods Hole, Massachusetts, who calls Sugar Land, Texas, home. O'Hara received her a Master's degree in propulsion and fluid dynamics from Purdue University in Indiana. As a student, she participated in NASA's KC-135 Reduced Gravity Student Flight Opportunities Program, the NASA Academy at the agency's Goddard Space Flight Center in Maryland and interned at NASA's Jet Propulsion Laboratory (JPL) in California. Dr. Francisco (Frank) Rubio, a 41-year-old major, serving as a surgeon for the 3rd Battalion of the U.S. Army's 10th Special Forces Group. Originally from Miami, Florida, Rubio earned a Doctorate of Medicine from the Uniformed Services University of the Health Sciences. Rubio has accumulated more than 1,100 hours of flight time in helicopters and performed more than 650 free fall skydives. Jessica Watkins, a 29-year-old postdoctoral fellow at the California Institute of Technology (Caltech), where she collaborates on NASA's Mars Science Laboratory for the Curiosity rover. Hailing from Lafayette, Colorado, Watkins earned a doctorate in geology from the University of California, Los Angeles. Watkins has also worked at NASA's Ames Research Center in northern California. 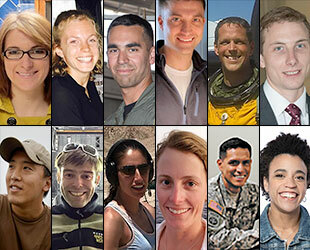 NASA's new astronaut class, as seen in social media photographs. The group includes seven men and five women, ages 29 to 42. NASA's astronaut corps currently has 44 active members, led by newly-named Chief Astronaut Patrick Forrester. 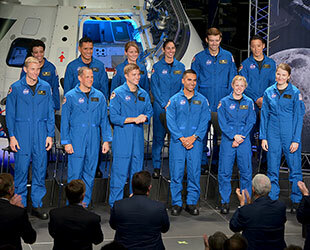 The 22nd group of astronaut candidates was selected out of a record 18,000 applicants, based on education, experience, and their interviews with NASA's selection board. "We are excited to welcome them to the team," said Ellen Ochoa, Johnson Space Center director and former shuttle-era astronaut. Selection as an ascan does not ensure becoming a NASA astronaut, which requires the successful completion of the basic training program. With the addition of the new class, NASA has selected 350 men and women to train as astronauts in its nearly 60-year history. "While their numbers may be few, their accomplishments have been legion — and the tales of our astronauts are a testament to the indomitable spirit of the United States of America," said Pence.